Ahmed’s father Mohamed Elhassan Mohamed, according to the Huffington Post, is transferring his son out of MacArthur and to another institution—hopefully one where his brains, Muslim faith and creativity will be celebrated/respected, though they’re unsure exactly where he’ll go next. 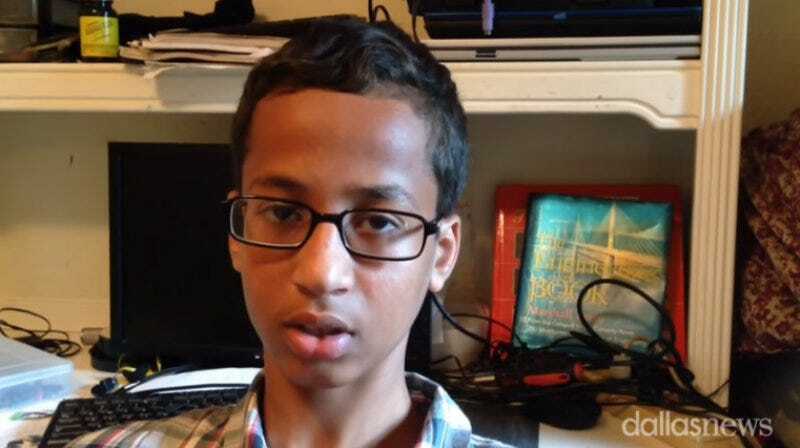 What is clear is that Ahmed’s already set up well for the long game. President Barack Obama, Facebook founder Mark Zuckerberg as well as former Secretary of State Hillary Clinton, Google, Twitter and even MIT have all reached out to the teen, offering a range of inspiring and encouraging words. Meanwhile, MacArthur is still trying to clean up its new image as the Texas school who arrests brown kids for doing smart things—with little success. The high school still has yet to apologize to Ahmed, but defended the staffer who called for the teen’s arrest; Ahmed is also technically still suspended for three days. Is this your hill of choice, MacArthur? Image via screengrab via YouTube/Dallas Morning News.